Demanding structural performance targets for Dubai’s first ‘smart’ hospital have led to the selection of Gyproc high performance partitions, wall and shaft linings, and suspended ceiling systems throughout the new state-of-the-art complex. 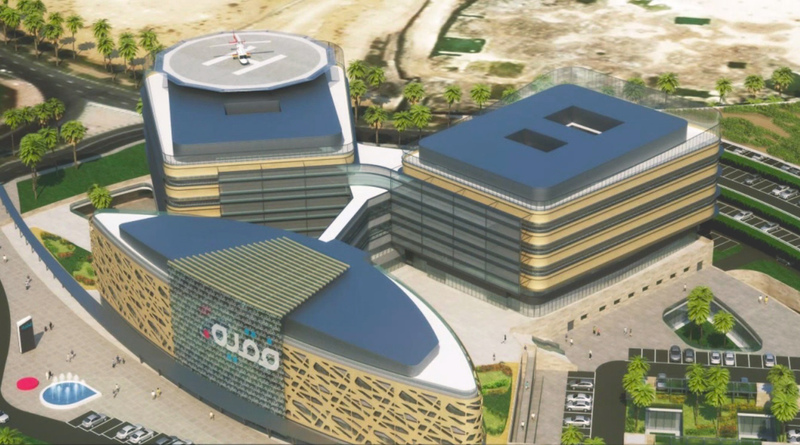 Under construction at Dubai Silicon Oasis, the high tech, government-owned free zone established in 2005 to promote technology-based development, the new 150-bed Fakeeh Academic Medical Centre is expected to become a hub for medical research and development in the region. As well as offering advanced services, like automatic medication dispensing, the centre will be the first to use robotic surgery techniques. To provide the internal environment essential to support the Centre’s groundbreaking work, consultants, Studio Altieri International, imposed demanding performance standards for every element of the structure. In particular, internal walls and partitions were required to meet a very high 50dB acoustic threshold in order to maintain a quiet and restful environment for recovering patients; along with fire ratings of up to 120 minutes and severe duty impact resistance to prevent impact damage to ward and corridor walls. Working closely with the design team, Gyproc’s technical experts developed a complete internal wall and lining package using the company’s high performance systems that satisfied all of the client’s requirements cost-effectively, as well as providing additional speed and efficiency benefits to support the tight build schedule. Valued at an estimated AED 2.25million the Gyproc systems will be installed by dry lining specialists, Artic Company LLC, for main contractor Al Habtoor Group. They include high performance GypWall CLASSIC partitions to provide acoustic separation between wards and treatment rooms, corridors, restaurants and other high traffic areas; specially developed Gyproc ShaftWall systems to provide sound and fire performance for shafts and risers; Dryliner and Gyplyner wall lining systems and Gyproc MF suspended ceilings. Where appropriate the systems will use high performance sound and impact-resistant plasterboard linings to provide the BS 5234 Severe Duty impact resistant finish required for corridors and other areas subject to regular impacts from wheelchairs, trolleys and heavy mobile hospital equipment.